A banking relationship designed to build wealth. keep more > build up > and easily manage your money. 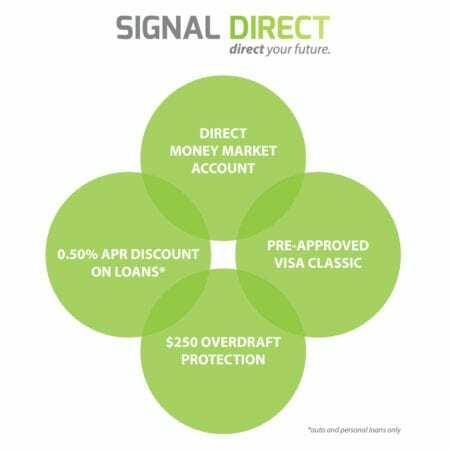 Signal Direct is the perfect banking bundle for anyone who wants a 360° banking relationship, anyone who wants to boost their savings quickly, or who needs to build credit and start saving at the same time. The only requirement is direct deposit into a Signal account—any regular monthly automatic deposit into your account, such as a paycheck, Social Security or other benefit payment, a regular deposit from a relative, etc. Use the Direct Money Market account to get a jump start on your savings: there’s no minimum balance requirement, and after your balance reaches $2,500, it earns a 1% APY!5 This is one of the best money market rates in the country! 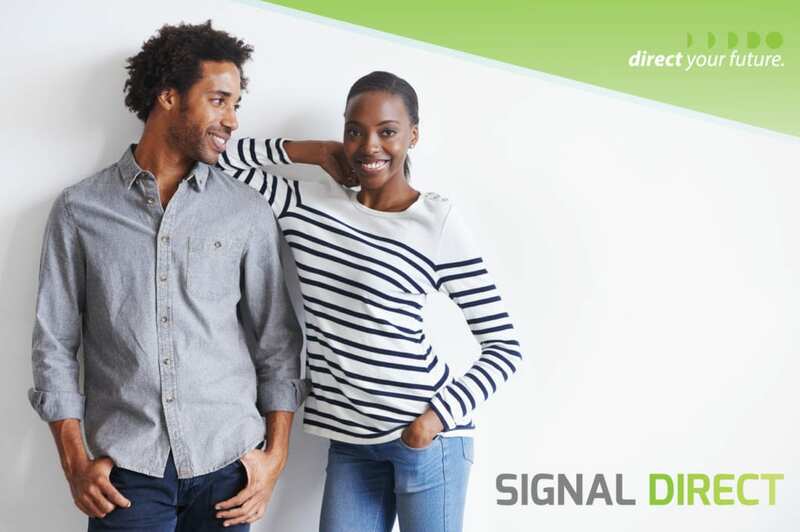 Together with checking and savings accounts, a debit card, and online banking and electronic statements to help you do your daily banking, Signal Direct has everything you need to manage your money. Call 301-933-9100, ext. 298 to find out more or to upgrade your membership! 1 Members may not revert to a lower tiered product bundle for a minimum of 6 months. 2 Unless otherwise specified, all advertised offers and terms and conditions of accounts and services are subject to change at any time without notice. After an account is opened or a service begins, it is subject to its features, conditions and terms, which are subject to change at any time in accordance with applicable laws and agreements. 3 Other transaction and service fees, including insufficient funds and overdraft fees, may apply. See our Fee Schedule for more information. 4 Direct deposit enrollment is required for this bundle. Must be 18 years or older to qualify for the Signal Direct bundle. 5 The Signal Direct Money Market accrues 0.00% Annual Percentage Yield (APY) on balances below $2,500. Visit www.signalfinancialfcu.org for current rates and terms. Visit www.signalfinancialfcu.org or contact a representative at 301-933-9100 ext. 105 for more information. Note: account maintenance fees will not be charged to members under the age of 18. See Membership Disclosure for credit union membership qualifications and eligibility. 7 An out-of-network ATM is any ATM that is not part of the CO-OP or Allpoint Networks or at a Signal Financial FCU branch. ATM surcharge fees from the other institution may apply. 9 Approved new loans only, with automatic payment transfer from your Signal Financial FCU account. Cannot be combined with any other offer. Existing loans excluded. Contact a Signal representative at 301-993-9100 ext 105 to learn more. 10 Average monthly balance is calculated by the total of your daily end of day balance divided by the number of days in the month. Certificate balances are not included in the average monthly balance calculation.